Amidst the chaotic control of the city, lies the serene beauty of Lalbagh Lake. Situated within the very famous Lalbagh Botanical Gardens, which is again known for varied flora and fauna, the lake is a bundle of scenic beauty. The lake though lacks boating ride, however, the facility is compensated by the picturesque attraction in the form of an island in the middle of the lake. While tourists visit to seek the serene solace at this amusing water body, local families and morning walkers drop here for picnicking quite often. The tree lined water magnificence fills the viewers with the colors of nature. Most of the trees are said to be exceeding good 100 years of its age. Pelicans, herons and egrets are some of the birds taking refuge at this lake. 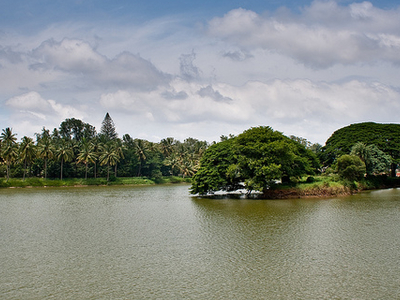 Here's the our members favorite photos of "Lakes in Bengaluru". Upload your photo of Lalbagh Lake! Ayesha Parija is the only Touristlink member to visit Lalbagh Lake. Have you been here? Click here to save it.